My kids were watching TV during the morning. But that wasn’t a part of our normal routine. I was sitting at the table eating alone and starting to feel a twinge on guilt for being off schedule. And then a comforting thought came into my mind this isn’t harming them. I don’t know about you, but I tend to feel overly guilty about things. So it was a big step for me to be able to stay calm when I knew they were all zoned into a screen during our “non-screen” time of day. Instead of wasting my time thinking through all the ways I knew this to be bad by their standard (whoever they are), I told myself we will adjust the afternoon routine. For us, watching an episode of Sesame Street everyday is okay. I’ve taught myself to not feel bad about that. I let go of the convictions of others, in order to embrace my own convictions and in doing so I am able to have a clear conscience. When I try to operate by following a list of someone else’s convictions – that’s when I feel guilty and defeated before I even start the day. When I try to carry someone else’s burden – I end up feeling exhausted, overwhelmed, guilty, and irritated. Why is it that all these negative side effects come from trying to do something good? Because there’s a difference between doing good and doing what’s best. I’ve learned that I must own my identity in order to know clearly how I am to live with purpose. When I have my beliefs and security firmly rooted, I can parent with peace. Living out this new way of parenting for me hasn’t been nebulous and abstract. On the contrary, I have strategically charted a way to discern my parenting convictions in order to have clear purpose and healthy boundaries – for my thoughts, actions, and feelings. Since discerning my parenting convictions, I have noticed that I’ve been more flexible, less tempted to compare my parenting to someone else’s, and free to live with intention because I’m not afraid of the details. To create a Parenting Purpose Statement (see link at the end of this post for a free guide). A parenting purpose statement creates a bond between the internal mission and the external actions. It forms a grid or filter through which all thoughts, actions, and activities can be processed to know quickly if it is in line with my goals. 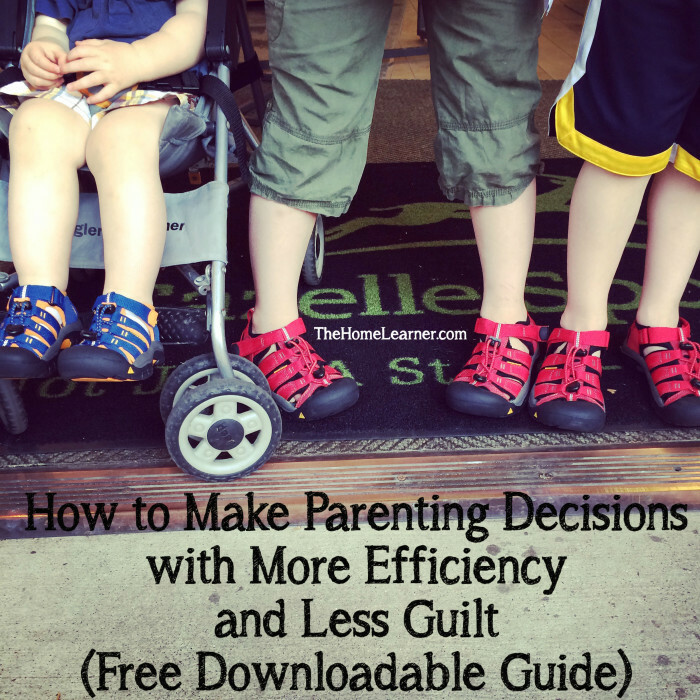 I can parent more efficiently – each decision big or small is quickly passed through the grid and I don’t waste time thinking about popular advice or what others are doing. In the end, I want to be fruitful with my life. I want to sow the seeds that will nourish my family. I don’t want to waste my emotions on whether my kids watch Elmo at 10am or 3pm. I don’t want to feel accountable to parent the same way others do. I want to focus on what makes me unique in my parenting and live up to the potential I have. This focus allows for a clear conscience, faster decision making, and less guilt. I’ve written a guide to help walk myself and others through creating Parenting Purpose Statement. Click here to download it. If you enjoy it please copy this link to share it! And consider subscribing to TheHomeLearner for more free content like this. ← Moving (& Simplifying) with Kids: Learning to be a minimalist. I’m so excited to find this site and this guide. I can’t wait to check it out! Thanks Kelly, I’m glad to “meet” you too. 🙂 I truly hope the guide encourages you.